Rem Koolhaas is considered by his many followers to be the coolest, hippest, and most cutting-edge architect on the planet. But, like all things cutting-edge, Koolhaas is difficult to classify. Since the late 1970s the Dutch designer has earned acclaim as an author, a theorist, an urban planner, a cultural researcher, and a professor at Harvard. And, of course, he has amassed an array of projects ranging in size from small—The Bordeaux House (1998)—to large—the CCTV Headquarters in Beijing, China (begun 2004)—to extra large—the Euralille complex, located in Lille, France (1994). Although his projects are viewed as visionary by most, they are also unusual and frequently constructed using inexpensive, everyday materials. As a result they have been described as inspired, weird, or downright ugly. A prime example of Koolhaas's mixture of beautiful and bizarre is the Seattle Central Library, located in Washington and completed in 2004. Some consider it to be a revolutionary structure that taps into Seattle's urban energy; others call it a blight on the city skyline. Regardless, it is the largest U.S. Koolhaas project to date, and it marks the clear beginning of his American phase. And, despite his critics, there is no doubt that the breakthrough designer is changing the face of contemporary architecture. As U.S. architect Frank Gehry (1929–) told Belinda Luscombe of Time, "I would say he's the most comprehensive thinker in the profession today. He's the hope for the cities." Rem Koolhaas was born on November 17, 1944, in Rotterdam, Netherlands, just four years after the major seaport city was destroyed by German bombing during World War II (1939–45; war in which Great Britain, France, the Soviet Union, the United States, and their allies defeated Germany, Italy, and Japan). His father, Anton, was a well-known Dutch writer and film critic, who, when Koolhaas was eight years old, traveled to Indonesia to serve as the director of a newly formed cultural institute. At the time, Indonesia had just broken ties with the Dutch, who had dominated the region since the seventeenth century. From age eight to twelve Koolhaas and his two younger siblings lived with their father in Jakarta, Indonesia. While there, the young boy developed a fascination with Asia that would continue into adulthood. "The word 'architecture' embodies the lingering hope—or the vague memory of a hope— that shape, form, coherence could be imposed on the violent surf of information that washes over us daily." After returning to the Netherlands Koolhaas eventually took up journalism as a career, writing for the Haagse Post. At the same time, he began socializing with film students and even dabbled in film school for a bit. In 1969 Koolhaas co-wrote a script called The White Slave, which was produced by Dutch director Rene Daalder. In interviews Koolhaas calls this early film a commentary on modern Europe using clips from B-movies (low-budget movies). The would-be filmmaker even wrote several screenplays for Hollywood directors, which were never produced. One day, while speaking about film to a group of architect students at the University of Delft, Koolhaas realized that what he truly wanted to do was build. Actually, the idea was not so farfetched because his maternal grandfather had been an architect, and that particular career option had always been lurking in the back of his mind. So, Koolhaas packed his bags and headed for London, where he studied at the Architecture Association School. He quickly became known for being an unconventional thinker, especially after he published several controversial papers, one of which proposed walling off portions of London and asking citizens to decide on which side of the wall they wanted to live. Because of his innovative ideas Koolhaas was given a Harkness Fellowship in 1972, which allowed him to study at the Institute for Architecture and Urban Studies in New York City. The Harkness Fellowship is administered by the Commonwealth Fund, a charitable foundation established in 1918 by U.S. philanthropists Anna and Edward Harkness; it allows academics and artists from outside the United States to study in the country for two years. While in New York, Koolhaas trained under noted American architect Peter Eisenman (1932–) and famed German architect O. M. Ungers (1926–). The thirty-four-year-old also became enthralled by what he viewed as the dynamics of New York City. Contrary to the popular notion of the time of urban sprawl (moving to and building in the outskirts of cities), New York was jam-packed with people living in what Koolhaas termed in many interviews as "the culture of congestion." In 1978, based on his observations, Koolhaas penned Delirious New York, which he frequently described as a "manifesto for Manhattan," and which discusses in detail patterns of urban growth. The book became an instant classic, and according to CNN.com, "Critics hailed it as a must-read on the subject of modern architecture and society." Therefore, oddly enough, before he laid a single brick on a single project the Dutch designer had achieved a level of fame that takes most architects years to achieve. When he was traveling and studying in the United States, Koolhaas was accompanied by his wife, Madelon Vriesendorp, an architect and painter. In fact, the two were professional partners as well as life partners. The dust jacket of Delirious New York features a Vriesendorp painting, and a few years earlier, in 1975, Koolhaas, Vriesendorp, and two friends, Elia and Zoe Zenghelis, formed their own design company called the Office for Modern Architecture. Known as OMA, which happens to mean "grandmother" in Dutch, the company was originally based in London, but eventually moved to Rotterdam in the West Netherlands. Marcus Fairs of Icon Magazine described it as a "hot-house research laboratory," and in 2004 OMA employed 85 staff members, with some 1,400 hopeful architects applying for employment each year. In its first decade OMA's designs were theoretical, meaning they were captured on paper but never actually built. Koolhaas submitted many striking and innovative ideas to several high-profile architectural companies and entered a number of competitions, but no one seemed interested. Finally, in 1987 Koolhaas was hired to design and build the Netherlands Dance Theater in The Hague. Composed of three areas, including a stage and auditorium; a rehearsal studio; and a complex of offices and dressing rooms, the theater garnered Koolhaas immediate acclaim. According to Koolhaas's profile featured on the Syracuse University Web site, it is considered by Phyllis Lambert of the Canadian Centre for Architecture to be one of the top nine buildings of the twentieth century. Following the dance theater commission Koolhaas was off and running, designing and constructing one-of-a-kind buildings of various size and scope all around the world. Some were small-scale residences, commissioned by individuals, such as the Villa Dall'Ava, located in Paris, and completed in 1991. The clients instructed Koolhaas to build a glass house with a swimming pool on the roof, with enough space to accommodate them and their daughter in separate areas. The result was a glass pavilion with two hovering apartments, one on top of another, each offering a panoramic view of the Paris skyline. Of course Koolhaas added his own brand of uniqueness by encircling the pool with orange, plastic webbing—the kind found at construction sites. Belinda Luscombe commented, "The clients asked for a masterpiece, and they got an adventure." Other Koolhaas-designed residences include the Nexus housing project (Fukuoka, Japan, 1991) and The Dutch House (Netherlands, 1995), but one of the architect's most important smaller projects is Maison á Bordeaux (The Bordeaux House), located in France. The house was named the best design for 1998 by Time magazine. Koolhaas designed the residence for a man who was wheelchair bound and who felt trapped by his traditionally structured home. To allow freedom of movement the architect created a glass elevator to travel between the house's three levels. The bottom level was the most amazing, consisting of a series of caverns carved out of the side of a hill. Each of Koolhaas's projects is truly unique and the architect is openly pleased that buildings are not easily identified as Koolhaas-designed. One element that remains consistent, however, is his use of everyday, often inexpensive materials, whether the structure is residential like the Villa Dall'Ava, or public, like the Kunsthal Gallery (1992) in Rotterdam. For the walls of the gallery Koolhaas used unfinished concrete and corrugated, or ridged, plastic; metal grids serve as the floor; and tree trunks are used as pillars. As the Dutch designer explained to Belinda Luscombe, "Architecture is always the encounter of vision and circumstance. The Dutch don't believe in spending a lot of money on buildings so there's no choice but to build with really cheap materials." In 1994 Koolhaas released his second major book, S, M, L, XL, an eight-pound, dense collection of essays, photos, observations, and designs that summarizes OMA's progress through the mid-1990s. The title refers to the way the architect decided to arrange the book: instead of a chronological timeline, it is organized by project size. That same year Koolhaas had his first exhibition at New York's Museum of Modern Art (MOMA). The exhibition drew sold-out crowds, and the six-foot-five, dapperly dressed Koolhaas graced the covers of such glossy magazines as Vogue and Harper's Bazaar. Thanks to his MOMA exposure, Koolhaas became a celebrity outside the world of architecture. But the true reason that 1994 marked a milestone year for him was the completion of the largest European urban planning project to date: Euralille. Euralille is the train hub in northern France that is the exchange between the Chunnel (the rail tunnel beneath the English Channel that connects England and France) and the European railway system. Koolhaas served as the city's master planner and faced the overwhelming problem that fifty million travelers passed through the hub each year, while 175,000 residents lived in the city year-round. The designer hired other architects to build commercial and business centers, but Koolhaas himself tackled the crowning pinnacle of the complex, the Grand Palais. Conceived as a convention center, the rambling structure served multiple purposes; it housed a convention hall, an exhibition hall, and a congressional hall under the same oval-shaped roof. In an attempt to add a feeling of warmth to the vast expanse of concrete walls and air-conditioning ducts, Koolhaas laid a square of carpet in the lobby, arranged a few chairs in the center, and suspended a wooden ceiling over the area, creating essentially a meeting space without walls. By 2000, although he had been building for only thirteen years (which is a short time in the slow-moving world of architecture), Koolhaas had completed projects in many countries, including the Netherlands, France, Portugal, Korea, Japan, and Germany. For his accomplishments he was named the Pritzker Prize Laureate for 2000, becoming the first Dutchman to be so honored. Named for the Pritzkers, a Chicago-based family of businessmen and philanthropists, according to CNN.com the prize "honors living architects whose collective work has shown unique talent and influence." The laureate receives a bronze medallion and $100,000, but more importantly the Pritzker is considered to be the highest achievement an architect can attain. According to Pritzker Prize jury chairman J. Carter Brown, as quoted on the Pritzker Web site, "Rem Koolhaas is widely respected as one of the most gifted and original talents in world architecture today. The leader of a spectacularly irreverent generation of Dutch architects, his restless mind, conceptual brilliance, and ability to make a building sing have earned him a stellar place in the firmament of contemporary design." Although he had scaled to the peak of the architectural profession Koolhaas had yet to conquer one final frontier—the American landscape. He received his first U.S. commission in 1996, a $3 billion plan to expand offices for MCA-Universal Studios in Universal City, California. The project, however, came to a halt in 1999 after funding fell through. Similar budget crunching put the brakes on other U.S.-based projects, including plans to expand the Whitney Museum in New York City and refurbishing the Los Angeles Museum of Art. In 1998 Koolhaas finally won his first U.S. commission when he was selected from an array of architects to design a new Campus Center at the Illinois Institute of Technology (ITT) in Chicago. The ITT campus is considered to be one of the premier architectural sites in the United States because twenty of its buildings were originally designed by renowned German architect Mies van der Rohe (1886–1969). Known as the McCormick Tribune Campus Center, the building was completed in September 2003, with Richard Lacayo of Time magazine calling it "another instant icon." Its most remarkable outside feature is an enormous corrugated steel tube that sits atop the v-shaped roof; Koolhaas designed the tube to muffle the noise of trains that zoom by overhead. Opposite page Rem Koolhaas's design of the Seattle Central Public Library, which opened in 2004, took six years and $165.5 million to complete. 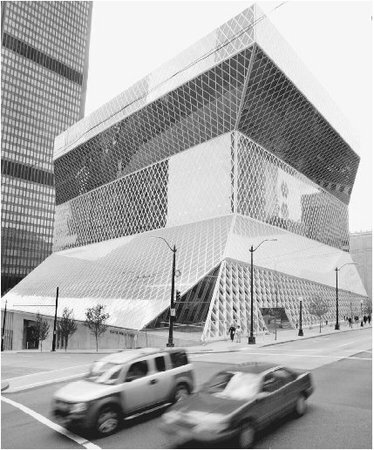 Koolhaas may have received a great deal of press for his ITT center, but the project that placed him firmly in the minds of Americans and brought him international acclaim was the Seattle Central Public Library in 2004. The $165.5-million project was approved by Seattle, Washington, citizens in 1998, and they waited in anticipation for six years to see what the innovative designer would deliver. The result was a 362,987-square-foot labyrinth that soars fifteen stories and has the capacity to hold 1.4 million books. Instead of the floors being stacked one on top of the other, Koolhaas created a series of five irregularly placed platforms that jut out forward and backward and sideways, giving the outside of the structure a maze-like look. Time magazine described the platforms as "flying carpets," claiming that patrons feel as though they're "suspended in midair." Instead of being housed neatly in different sections, the library's books are arranged in a continuous spiral that flows through the four central floors. Patrons move through the spiral along zigzagging ramps, which, according to city librarian Deborah Jacobs, who spoke with American Libraries, gives them "the freedom to move throughout the entire collection without dependence on stairs, escalators, and elevators." Interspersed along the spiral are four open areas featuring a children's library, reading rooms, reference desks, and a fifth-level "mixing chamber," that houses four hundred computer stations. Each section is carefully color-coded in sometimes shockingly brilliant hues. For example, men's restrooms are bright green; the elevators are pea-green; and the fourth-level meeting room is fire engine red, and according to Lawrence Cheek of the Seattle Post-Intelligencer, "resembles the digestive tract of a giant sea mammal." Like all of Koolhaas's projects, the Seattle Library sparked all kinds of conversation and debate. Some reviewers raved, like Charles Mudede, who was quoted in the Seattle Post-Intelligencer : "What the downtown library did on the day its doors were opened is activate Seattle's urbanity." And, an American Libraries article included a quote by noted critic Herbert Muschamp, who remarked: "In more than 30 years of writing about architecture, this is the most exciting new building it has been my honor to review." Even those who work in the building sang its praises. As librarian Linda Saunto told American Libraries, "It is so beautiful, and it is such a joy to work in a building that is so full of light." Of course, the library was not without its critics. The August 2004 issue of American Libraries included a comment by Barb Guy of the Salt Lake City Tribune, who claimed the structure "looks like a gargantuan ventilation duct plunked into downtown." Ultimately, however, the most important critics were the patrons. As of June 2005 book circulation was up 50 percent over the old library, and the number of visitors patronizing the library was up 60 percent. In addition the glass-and-steel structure was drawing tourists to Seattle in droves, and it was becoming a regular gathering place for city residents. The library was so popular and unique that a couple actually held a wedding there. On the Pritzker Web site, a prize jury member commented that Seattle had to brace itself "for a wild ride with a man famous for straying outside the bound of convention." Despite his triumph in Seattle, in the mid-2000s Koolhaas began to turn his attention toward Asia, where the population and expansion explosion guaranteed an increasing number of projects. His biggest commission came in 2002 from the Chinese government to design and build a new headquarters for the state-run China Central Television (CCTV) in Beijing. A massive undertaking, the project is expected to be completed in 2008. When not designing, overseeing a project, or globetrotting from his Rotterdam offices to his home in London, Koolhaas works as a professor on the faculty of Harvard University. Instead of simply teaching design Koolhaas established a research unit that studies contemporary cities. The research findings were being published in a series of books that focus on topics such as shopping and urban conditions in China and Nigeria. The first in the series, Harvard Guide to Shopping, was published in 2002. In May 2004, Koolhaas also published a follow-up to S, M, L, XL, called Content, which chronicles recent OMA projects and includes essays and commentaries by Koolhaas on the state of twenty-first century architecture. Rem Koolhaas may be well known for his writings and commentaries on the future of architecture, but many believe that Koolhaas himself is the future in the now. According to Marcus Fairs of Icon Magazine, "Koolhaas has established himself as architecture's most prolific, influential and extreme oracle [visionary]." And, as the unconventional Dutchman told Fairs, he has no intention of slowing down. "There is no plateau of resting or stabilizing," Koolhaas explained. "Once you are interested in how things evolve, you have a kind of never-ending perspective, because it means you are interested in articulating the evolution, and therefore the potential change, the potential redefinition." Critics Rave over Koolhaas Design." American Libraries (August 2004): p. 12. Lacayo, Richard. "One for the Books." Time (April 26, 2004). Luscombe, Belinda. "Making a Splash: Rem Koolhaas." Time (April 8, 1996). Barrie, Andrew. "Freed Architecture." Japan Times Online (November 5, 2003). http://www.japantimes.co.jp/cgi-bin/getarticle.pl5?fa20031105a2.htm (accessed on August 23, 2005). Cheek, Lawrence. "On Architecture: New Library Is Defining Seattle's Urban Vitality." Seattle Post-Intelligencer (June 28, 2005). http://seattlepi.nwsource.com/visualart/230248_architecture28.html (accessed on August 23, 2005). Fairs, Marcus. "Rem Koolhaas: Interview." Icon magazine (UK) (June 2004). http://www.icon-magazine.co.uk/issues/013/rem.htm (accessed on August 23, 2005). "Koolhaas Receives 'Nobel of Architecture' in Jerusalem." CNN.com : Arts and Style (May 29, 2000). http://archives.cnn.com/2000/STYLE/design/05/29/pritzker/index.html (accessed on August 23, 2005). Office for Metropolitan Architecture Web Site. http://www.oma.nl/Oma.htm (accessed on August 23, 2005). "Profile of Rem Koolhaas." Harvard University: Harvard Design School. http://www.gsd.harvard.edu/people/faculty/koolhaas/index.html (accessed on August 23, 2005). "Profile of Rem Koolhaas." Syracuse University: Lecture Series. http://provost.syr.edu/lectures/koolhaas.asp (accessed on August 23, 2005). 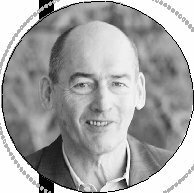 "Rem Koolhaas: Pritzker Architecture Prize Laureate 2000." Pritzker Prize Web Site. http://www.pritzkerprize.com/2000annc.htm (accessed on August 23, 2005). its Office for Metropolitan Architecture, not modern architecture, unless there is an ironic twist in there somewhere.